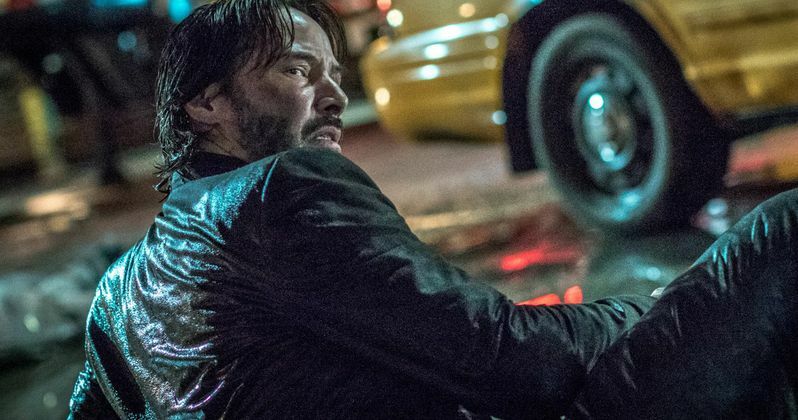 Some new behind-the-scenes videos from the set of John Wick Chapter 3 have leaked online featuring Keanu Reeves and Laurence Fishburne both looking injured and a lot worse for wear. Production for the third installment in the John Wick franchise began a few weeks ago and thanks to this sneak peek, we have an awesome glimpse as to what's taking place in New York. There are more exotic locations to come, but for now, John Wick 3 is filming in the gritty, grease stained streets of the Big Apple, which means that more set videos are more than likely to leak online the near future. The first of the intriguing John Wick 3 behind-the-scenes videos includes Keanu Reeves as Wick on the sidewalk. The character appears to be badly injured and can't get up while an undisclosed villain rises from an apparent motorcycle crash. The identification of the character is unknown at this point, but he looks to be one of the many who are trying to make sure Wick does not escape New York alive. Another one of the new set videos from John Wick 3 features Laurence Fishburne as the crime lord and Wick ally, the Bowery King, letting a white dove free while chatting with some associates in the rain. However, it looks like the Bowery King might not make it through the third and final movie alive. After the white dove is set free, a new villain takes out a sword and slashes Fishburne twice across the torso. It doesn't look good for the Bowery King after letting the white dove free, which is usually a sign of peace. John Wick 3 introduces Halle Berry as a new assassin named Sofia. While it was originally thought that she would be a villain, she's actually a Wick ally as well. In addition to Berry, John Wick 3 also features Anjelica Huston as The Director, Mark Dacascos as Zero, Jason Mantzoukas as Tick Tock Man, and Asia Kate Dillon as The Adjudicator. Most of the details of the third installment in the John Wick 3 are under wrap, but director Chad Stahelski promises a more intense movie while also revealing why they're all chapters. Keanu Reeves has been spotted on the set of John Wick 3 frequently over the last few weeks, as has Halle Berry. But, the newly leaked video featuring Laurence Fishburne's Bowery King is the most intriguing so far. Unless there's a significant plot twist, it looks like the Bowery King will not survive the third chapter. We'll find out soon since John Wick 3 will officially hit theaters on May 19th, 2019. The project released a social media save the date invitation on social media on May 19th, 2018, exactly one year before the movie hits theaters. Excitement is high for John Wick 3 and you can see the brand-new set videos below, thanks to the Keanu Reeves Kudos Instagram page.